The Brown University HS Northeast Invitational takes place in Rhode Island, but it sure felt like New York on Saturday. 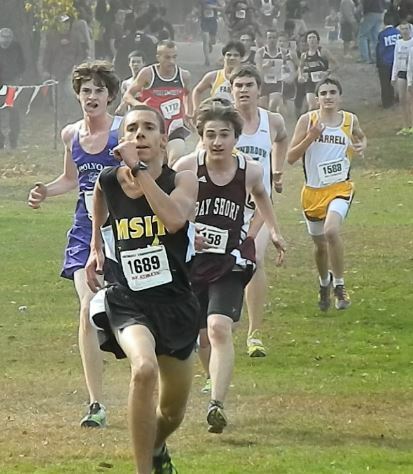 In the 12 races held at Goddard Memorial State Park, the Empire State captured eight team titles and eight individual victories, five of which came in the varsity races. One of the most exciting races of the afternoon occurred in the Championship Girls where Benjamin Cardozo senior Denise Branch out-sprinted Tiana Guevera of Miller Place (N.Y.) the final long straightaway to win with a time of 17 minutes, 52.2 seconds for the fast, five-kilometer course. Guevera was second at 17:53.8. New York’s Brigid Brannan of Northport was third to lift her team to a 69-75 victory over Miller Place. Branch, who was tenth in the Eastern States Championship at last week’s Manhattan Invitational, took the patient approach. Marco Pompilj of the Collegiate School (N.Y.) was able to sustain a quick, early pace to break the tape in the Championship Boys’ race. He was clocked in 15:13.4, just 30-meters ahead of St. Benedict (N.J.) sophomore Edwin Rutto, who was timed in 15:17.4. Pompilj battled the Kenyan-born Rutto for most of the final mile and didn’t take the lead until the last 200 meters. Cambridge Rindge Latin won the team crown, defeating last year’s champion St. Anthony’s (N.Y.), 65-85. 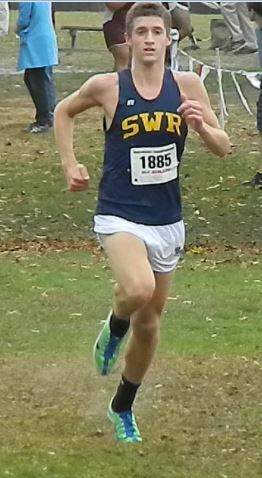 Shoreham-Wading River (N.Y.) senior Ryan Udvadia copped the Varsity Boys’ Division I race for the second straight year. Udvadia assumed control of the front-runner position with about a half-mile remaining and coasted across the line with a personal-best of 15:34.6. Tucker McNinch of Lenox Memorial (Mass.) placed second at 15:45.8. The SWR standout had plenty of confidence coming into the race. His victory at Brown continues an unbeaten streak this fall. Keith Steinbrecher (16:21.8), Matthew Gladysz (16:22.6) and Connor McAlary (16:22.9) took the ninth through 11th positions as Shoreham took the top prize with a 44-64 decision over Robbinsville (N.J.). Eighth-grader Katherine Lee of Shoreham-Wading River was a nine-second winner in the Varsity Girls’ Div. I race with a PB of 18:37.2. Claire Gomba, a junior from Hackley School (N.Y.), was second at 18:46.2. In team competition, Robbinsville beat Friends Academy (Mass. ), 136-177. Lee took the lead just past the mile mark and continued to extend on it to the finish. Shannon Ahern, a senior from King Parks (N.Y.), took the hardware in the Varsity Girls’ Div. 2 race. 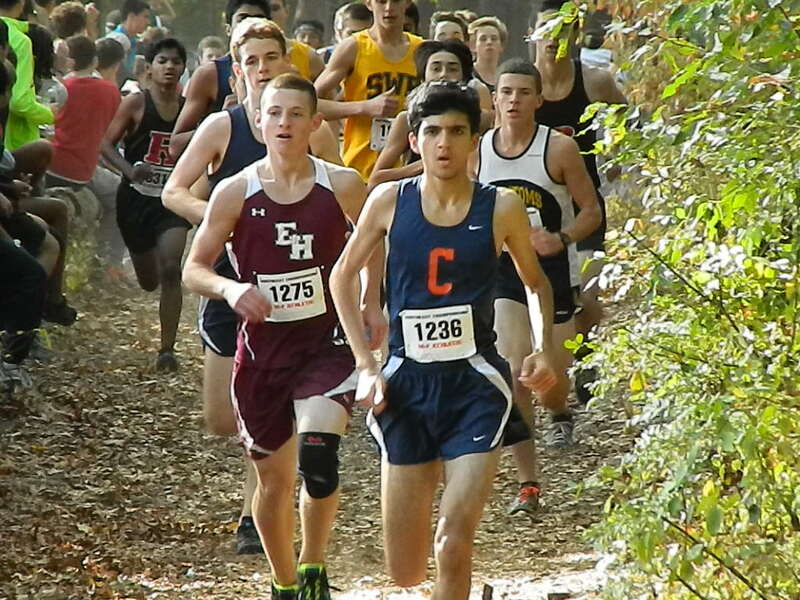 Ahern held off Eastport South Manor (N.Y.) freshman Taylor McClay with a time of 18:24.7. McClay finished at 18:26.8. 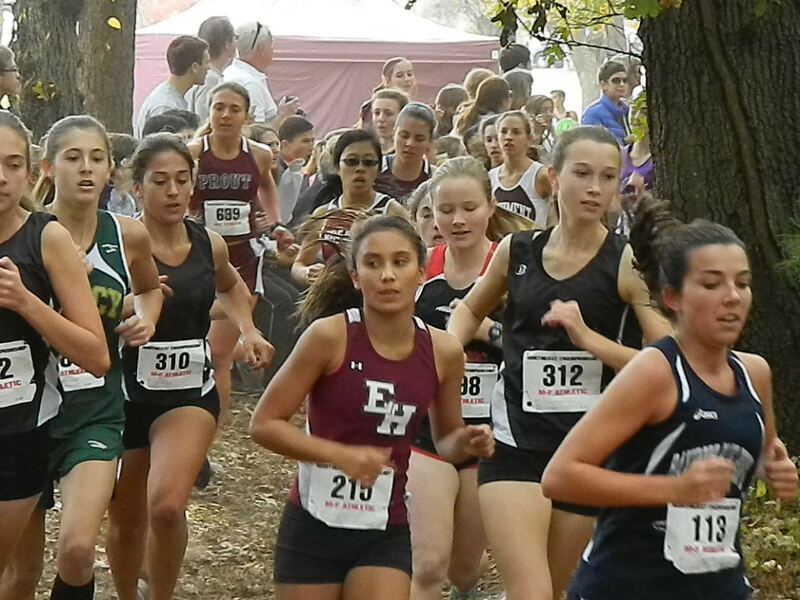 Ahern, McClay and Eastport sophomore Alexandra DeCiccio (third, 18:35.8) broke from the field early. With the race winding down, Ahern and McClay distanced themselves from DeCiccio for their battle to the finish. For Ahern, it’s been a hectic fall season and it has nothing to do with the cross-country trails. Colonie Central (N.Y.) easily won the team crown, defeating fellow New York school Wad Melville, 59-104. New Jersey’s Steve Maine of Highland Regional broke the streak of New Yorkers in the varsity competition by winning the Div. 2 race with an impressive 15:18.7 clocking, the third fastest time of the afternoon. Highland also won the team title with a 59-98 victory over Monsignor Farrell (N.Y.), 53-98. For complete coverage of the Brown Invite, click here.